Home > Training scripts > Real estate training scripts. Real estate training scripts are used for prospecting. Real estate training script program includes a 210 page instruction manual that teaches you how to write a sales script. Objectives of the real estate training script program is to emphasize prospecting for new business. Real estate script training programs goal is to train their salespeople to use the proper prospecting dialogue and techniques. If salespeople successfully learns the proper sales training techniques to talk to a potential prospect, after a period of time they remember the dialogue when they get out in the field. 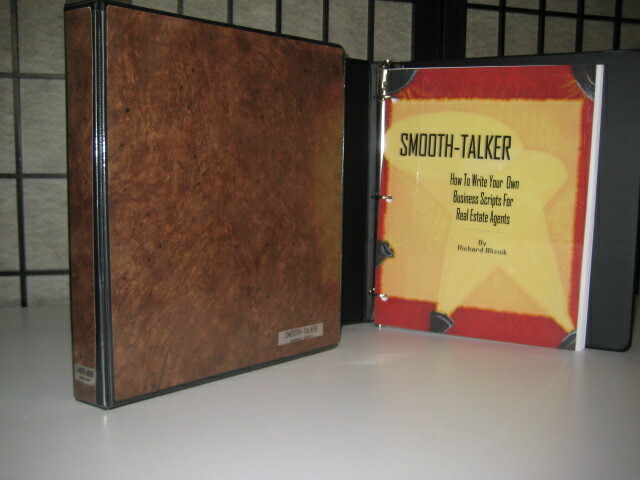 Smooth-talker real estate training scripts consists a complete leatherette 3-ring binder that has 60 pages of scripts. There all cut down in a staggered way so you can view 12 pages at a glance. 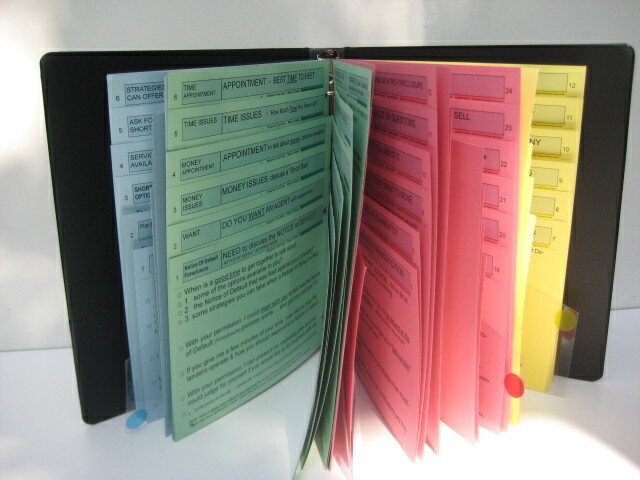 Included is a 24 page instruction manual plus extra pages for you to write additional scripts if you need them. Real estate training scripts includes prospecting dialogue intended for agents to make prospecting calls to Expired listings, For Sale By Owner, Cold-calling and Farming. What you can expect from the real estate training program. To some real estate training departments, it's only a page of the manual for training new agents. We wouldn’t have this problem if there were a simple fix. But the fact is that most everyone has a general idea of what they intend to say in any situation, but spend little or no time thinking and "writing out every word" in advance. New real estate agents don't develop speaking skills and sales managers cannot hope to solve this problem. Real estate agents often can't remember what to say when making a telephone prospecting call. The real estate agents inadequate skills and abilities often don't measure up. Script training for real estate courses give lip service to sales training. Memory recall of real estate sales agents is insufficient to retain skills. Having an insufficient memory is not a conscious choice but an inherent problem that everyone has. made a telephone prospecting call. Your thoughts seemed clear and the outcome you thought would be positive. What went wrong? to say is difficult if not impossible. Lots of motivation but not much on word skills. Real estate programs have always thought that motivational problems were the result of the way that a salesperson makes conscious choices when they attempt at telephone prospecting. Real estate sales trainers often think that it is a weakness on the part of the salesperson when they don't relish making prospecting calls. They point to many weaknesses instead of main one; fear of rejection. Fear of rejection is common in everyone; it’s just a matter of degree. Real estate training script program includes 4 "all purpose" scripts. This real estate training script program consists of a 210 page instruction manual plus four (4) 60 page real estate training scripts for new agents. Written for real estate sales managers and real estate trainers for teaching agents how to prospect using the telephone. The real estate training scripts comes with everything needed for real estate prospecting. 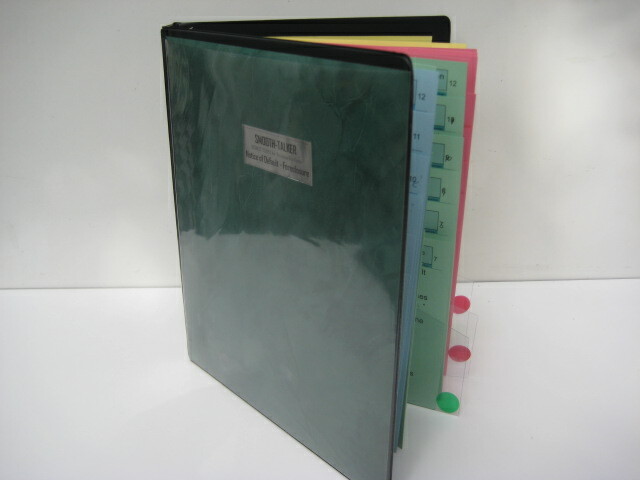 Additional prospecting scripts are priced at $97.00 individually if bought separately. Attitude is not the real problem. Real estate agents quite often have a bad attitude toward prospecting. It is said that only the strong will survive in a competitive business environment. True enough, but just what constitutes “strong.” Smooth-talker's goal is to provide real estate trainers with training scripts for new agents. Knowledge, skill, and preparation are the attributes required for strength in business. Even athletes need more then physical strength to be competitive. When prospecting for new business, the longer a salesperson has been doing it the more cumulative bad experiences have occurred. The irony is that instead of getting better at coping with people's bad behavior, they seem to let negative human emotions pile up. Training programs should devote more time to teaching prospecting. The real estate training program is meant for salespeople to learn sales prospecting. It's difficult to find training scripts to teach salespeople. It’s also hard to find a sales training class that teaches salespeople How-to write a sales script. A whole new kind of savvy sales manager with sales script writing skills is emerging. Real estate trainers claim that half of their time is spent on retraining and teaching the things that they assume the salespeople had learned. Sales trainers mostly teach a pitch style of prospecting script. They think that a pitch style of sales script is the same as a prospecting script, it is not. No matter how hard you try they will not adapt new sales training techniques unless they really want to. It's the same with salespeople and learning these sales training techniques. Many companies keep trying the same old tactics and wonder why they can't achieve results. You never know what you need until you find it. Sales management is always searching for prospecting ideas and new tools for training program for real estate. Companies are searching for training classes to teach salesmen how-to get new business. It has become more competitive then ever for reaching potential customers. Sales trainers have long been aware that the average prospect has a low tolerance for high pressure. Tendency is to be complacent when times are good. Complacency when times are good has caused sales managers to ease up on sales training. How often have you heard sales managers say, “Things are good and we have all business we need.” When business is good, sales manageers are not open to new ideas. Sales managers may not prefer to take risks and aren't interested in making things better. They are satisfied and want to enjoy life now that times are good. They don't realize that can they can capture even more market share. Training is hard work. Good sales training cannot reduce the amount of sales calls that get hostile treatment. Blame those who come before you for the hostility you may get when making a prospecting sales call for getting new business. You have no control over many things in sales and it is something you have to work around. Sales trainers report that prospecting is like a war out there. Unprecedented events resulted in creating a monumental hurdle for anyone attempting to use the phone for developing new business. It is neccessary to ignore the people who say they dislike all of today’s tactics for developing new business. Success depends on your speaking skills. The successful real estate agent has a command of the language is based on having a huge number of words imbedded in their memory. Successful real estate agents have a better chance for choosing the best words to use because they have a bigger selection to choose from. What new salespeople learned about prospecting was too little and too late. New salespeople often refuse to learn. "I know all I need to know." An obstacle for real estate sales managers and real estate trainers is how to overcome people with a closed mind. My college degree paid off because I know how adults learn. I just knew that my degree in Business Education from Eastern Michigan would come in handy someday. Having studied how adults from all walks of life and all sorts of experience learn once they are out of highschool and college. Writing the scripts has tought me that adults prefer something simple, effecient, and easy to learn. That is why I chose to write sentences with 10 to 20 words that are easy to speak and are trouble-free to listen to. I try to use one-syable words and avoid long complicated sentence structure. In short, the scripts consist of short "1-liners." Success depends on the words that you use. Often in real estate sales training scripts the actual words get glossed over. A script for real estate training just adds the proper elements to every prospecting situation. If you can remove the fear of the prospecting call, your business revenue will increase. If a sales scripts can be written with correct English, it can also be amended to exclude improperly worded dialogue. As long as sales scripts is delivered as it's written, it will be acceptable. "Awsome" .. "Like" .. "You know what I mean." A script eliminates the language of the day. It drives salesmanagers crazy whan the hear a sales person say "awesome" and "like" when they are making prospecting calls. They use the words such as "basically" and "actually" in their sales talk which takes up valuable time & often irritates the prospect. Sales scripts for prospecting guarantees that salesperson does not use these "word whiskers" and street slang they are calling on prospects. The people available for todays real estate positions? The people available today for real estate training, primarily gen-xer's, feel "entitled" to a 9 to 5 job with perks such as a great deal of time off for hobbys. Those kind of salespeople are well-mannered "order takers" and prefer to avoid any discomfort such as rejection!" The younger generation was raised on these words but is totally inappropriate in a business conversation. A written sales script tends to guide a salesperson with the proper words, especially an inexperienced salesperson. Scripted with skillful words prevents them from slipping into old habits. A sales managers problem is that they are always repeating themselves. Sales training courses are designed for generating new business has become important part of the real estate business. Sales trainers must cope with the high cost of training sales people. The sales training is meant for salespeople to learn prospecting. It's difficult to find real estate training scripts to teach salespeople. A whole new kind of savvy sales manager with sales script writing skills is emerging. Sales managers claim that half of their time is spent on retraining and teaching the things that they assume the salespeople had learned. they can use on a daily basis. Speakers spend so much of their time amusing their audience that they leave little time for substance. Salespeople are reluctant to try new types of sales tools. Salespeople are reluctant to try something new including scripts. They will not adapt new sales training scripts unless they really want to. Many companies keep trying the same old tactics and wonder why they can't achieve results. Salespeople don't know what they don't know. Sales trainers give good advice when they say to listen to the following; It’s always good to “know what you don't know.” When you find out what you don't know, you have a vivid picture of what you'll need to do. Never refuse to examine your reasoning to discover new real estate sales training script principles. The market place is unforgiving in that it harms the ineffective and rewards excellence.